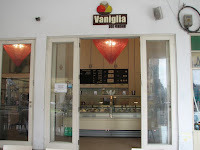 Vaniglia probably has the best ice-cream in Tel Aviv and you will want to taste everything there - which is quite possible considering their vast flavors assortment. The combinations such as camomille with vanilla or vanilla ginger are just an example on how adventurous they can get. But besides wild experiences, highly recommended are the fruit sorbet flavors, such as the mango, melon and plum. These are the best in this joint. If you don't mind the calories and you're not afraid to go all-the-way creamy, try the pistachio, chocolate or the yoghurt with pine nuts. If you want eat in you can go inside to a small, airconditioned and quiet niche. You can also get ice cream takeout - A container of 1 kg is 77 NIS and you can choose 5-6 flavors. Iben Gvirol - Iben Gvirol just a bit further from Rabin square when you face north. For the Bograshov branch, go towards the sea on the right side, it should be somewhere in the middle. For Dizengoff branch just go north, it's where Dizengoff st. intersects with Yirmiyahu. Basel - take right on Basel st. from Dizengoff, than go straight till you hit the cafe's area, then take right.